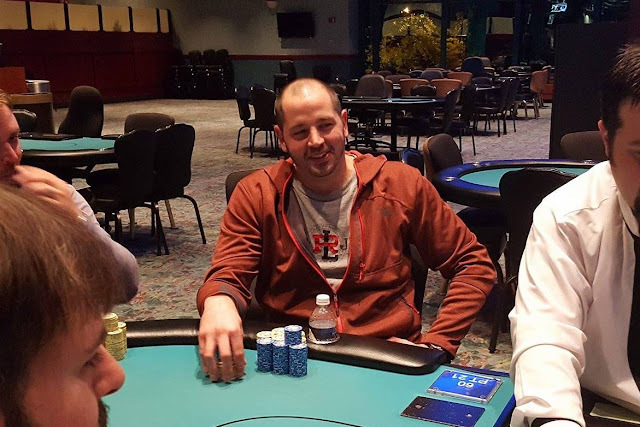 Just one hand after the 3rd place elimination of Dan Fairweather, David Grandieri has just been eliminated in 2nd place. Jason Calnan raised to 60,000 on the button and Grandieri reraised to 120,000. Calnan called. The flop came K♦7♥6♥. Grandieri bet 90,000 and Calnan called. The turn was the 2♥. Grandieri checked, Calnan bet 120,000 and Grandieri called. The river was the K♠. Grandieri checked again, Calnan announced that he was all in (having Grandieri covered), and Grandieri called. Calnan turned over 8♥3♥ for the flush. Grandier said, "This is how good you run," as he lightly tosses A♣A♠ down on the table. Grandieri is taking home $7,187 for his 2nd place finish.